The gift of pizza and so much more! Enjoy your favorite pizza, ranging from traditional hand-tossed crusted to handmade pan pizza, as well as a delicious variety of specialty pizzas. Want more than pizza? Try one of three varieties of Stuffed Cheesy Bread, Oven-Baked Sandwiches, Parmesan Bread Bites, or Chocolate Lava Crunch Cakes. and so much more. You can easily see their entire menu, locate the Domino’s nearest you and order online at dominos.com. A Domino’s Pizza gift card is perfect for someone who loves pizza, wings, oven-Baked Sandwiches or…you decide. •	Plastic gift cards can be redeemed at dominos.com by entering the Gift Card code/PIN when checking out; can also be used over the phone by providing the Gift Card code/PIN to the CSR or bring the Gift Card for use in-store. 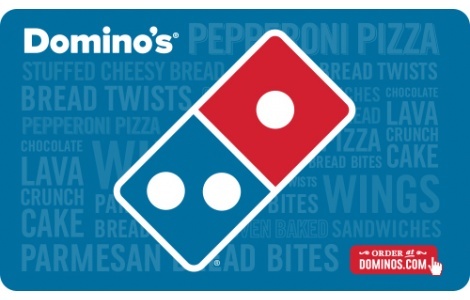 •	EGift cards can be redeemed at dominos.com by entering the Gift Card code/PIN when checking out; can also be used over the phone by providing the Gift Card code/PIN to the CSR or print & bring the eGift Card with code/PIN for use in-store. National Gift Card is the best place for you to order Domino's gift cards in bulk. We are the experts in all things gift cards and can set up your gift card solutions program for you today. Please contact us for more information on Domino's bulk, direct-to-recipient, or individual gift card fulfillment for your gift card program. Contact us online or call us at 888-472-8747 today! Usable up to balance only to buy goods or services at participating Domino’s Pizza stores in the U.S. Not redeemable to purchase gift cards. Not redeemable for cash except as required by law. Not a credit or debit card. Safeguard the card. It will not be replaced or replenished if lost, stolen or used without authorization. CARDCO CXXV, Inc. is the card issuer and sole obligor to card owner. CARDCO may delegate its issuer obligations to an assignee, without recourse. If delegated, the assignee, and not CARDCO, will be sole obligor to card owner. Resale by any unlicensed vendor or through any unauthorized channels such as online auctions is prohibited. Purchase, use or acceptance of card constitutes acceptance of these terms. For balance inquiries go to www.dominos.com or call 877-250-2278 and for other inquiries visit www.dominos.com. Dominos IP Holder LLC. Dominos®, Domino’s Pizza® and the modular logo are registered trademarks of Domino’s IP Holder LLC.